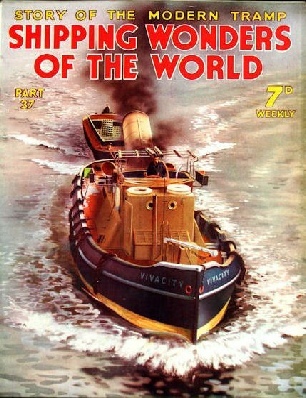 Part 37 of Shipping Wonders of the World was published on Tuesday 20th October 1936. 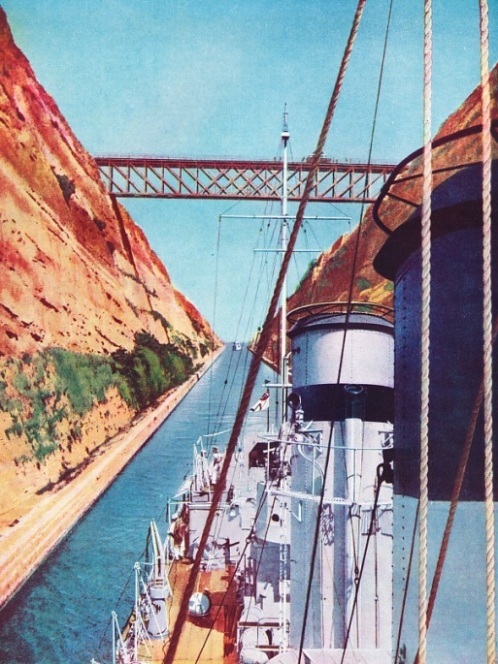 This issue included a colour plate illustrating HMS Duncan leading the First Destroyer Flotilla through the Corinth Canal. It formed part of the article on the Corinth Canal. The plate was attached to page 1181 of part 37. The plate had previously appeared as the cover to Part 7. This week’s cover shows the Thames tug Vivacity passing under a bridge. The picture is particularly interesting because it shows the tug in the act of lowering her funnel, which would otherwise be too high to clear the bridge safely. Above is a drawing of the Comanchee, one of the most interesting and important tankers flying the Red Ensign. She was delivered to her owners, the Anglo-American Oil Company, by John Brown & Company, early in 1936. Another illustration of her appears in the article on The Development of Oil Tankers in part 23. The Comanchee has frequently to discharge complete cargoes at Manchester and her dimensions were largely governed by the dimensions of the locks on the Manchester Ship Canal. Even so she is much bigger than any of the previous vessels built for the carriage of lubricating oils. She has a length between perpendiculars of 445 feet, a moulded beam of 61 feet and a moulded depth of 32 ft 2 in. The deadweight capacity is 10,310 tons and the summer draught 26 ft 4 in. The cargo space is divided by two longitudinal bulkheads and by transverse bulkheads into 27 separate compartments, with two cargo pump-rooms fitted with eight independent pumps. This permits of the carriage of many different grades of lubricating oil. Heating coils are fitted to those tanks intended for transporting the heaviest grades, and the vessel is equipped also with the Butterworth system of tank cleaning. In this system jets of hot water at high velocity are automatically projected against every part of the vessel’s tanks, ensuring a perfectly clean condition before reloading. One of the great disadvantages in the older design of tanker is the necessity of carrying water ballast in the cargo tanks. In the Comanchee this has been obviated by the fitting of a special double bottom for water ballast. The hull is built on the Isherwood system, and the general arrangement is typical of many tankers to-day, high-class accommodation being provided for officers and crew. The captain, officers and wireless operator are accommodated in a house just forward of amidships and, in accordance with the standard practice of the owners, the engineers, crew and all messroom arrangements are aft. Propulsion is by a four-cylinder Doxford opposed piston diesel engine, which gives the ship in service a speed of 13 knots when developing about 3,000 bhp. 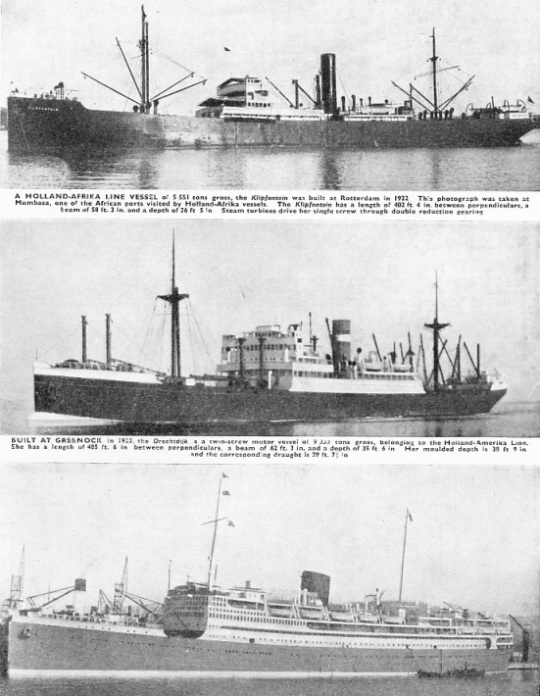 This is the twenty-eight article in the series on Merchant Ship Types. Although Auckland, in North Island, is the largest city in New Zealand, Wellington, also in North Island, is the capital of the Dominion and the chief transhipment port. 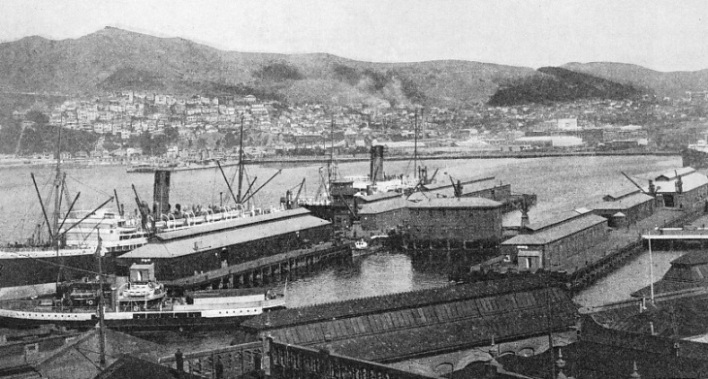 The harbour of Wellington, set in magnificent scenery, is called Port Nicholson. This chapter is by Sidney Howard and is the eleventh article in the series on Great Ports of the World. The story of the Armada, concluded from part 36. 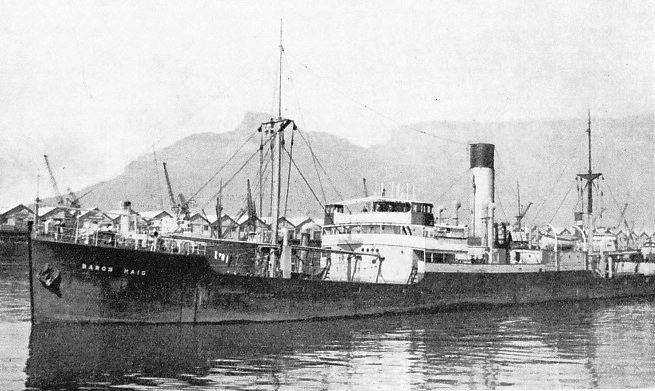 A HOLLAND-AFRIKA LINE VESSEL of 5,551 tons gross, the Klipfontein was built at Rotterdam in 1922. This photograph was taken at Mombasa, one of the African ports visited by Holland-Afrika vessels. The Klipfontein has a length of 402 ft 4 in between perpendiculars, a beam of 58 ft 3 in and a depth of 26 ft 5 in. Steam turbines drive her single screw through double reduction gearing. BUILT AT GREENOCK in 1923, the Drechtdijk is a twin-screw motor vessel of 9,333 tons gross, belonging to the Holland-Amerika Line. She has a length of 485 ft 6 in between perpendiculars, a beam of 62 ft 3 in, and a depth of 35 ft 6 in. 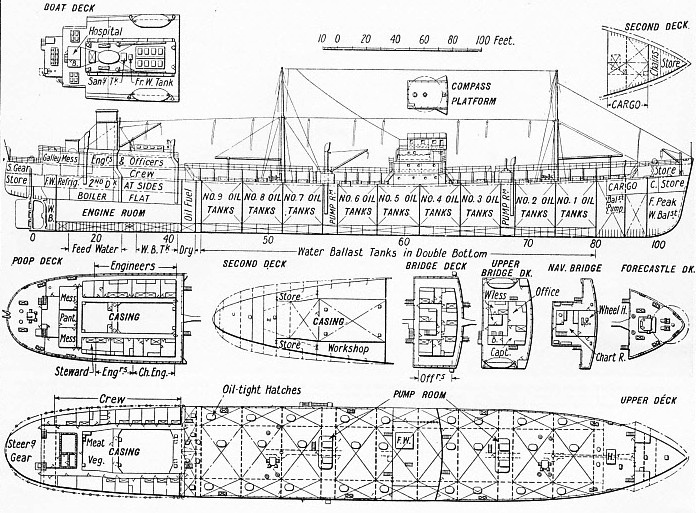 Her moulded depth is 38 ft 9 in and the corresponding draught is 29 ft 7½ in. From the days of ancient Greece and Rome the question of a canal across the Isthmus of Corinth had been seriously considered. A canal was begun in AD 67, but it was not until 1893 that the project was realized and a new link in European maritime communication was made. The mariners of ancient Greece seldom dared to voyage out of sight of land. Hugging the coast as they did, they naturally encountered difficulties in rounding some of the rocky headlands and capes of the Peloponnesos. Naturally, therefore, the Greeks conceived the idea of taking their ships overland across the four mile of country which form the narrowest part of the isthmus of Corinth. The idea of a canal naturally evolved from this portage (as the overland transport of ships is called) and nearly 600 years before the Christian era, a canal was planned across the Isthmus of Corinth. The first plan, however, came to nothing and it was left for the Roman Emperor Nero to start the work on the canal. If completed, the canal would have been one of Nero’s few useful achievements, but again the work was abandoned, and it was not until 1,800 years later that the Corinth Canal became a reality. Although the Corinth Canal cannot rank with the Suez or Panama Canal, it is not without significance among the trade routes of Europe, and it certainly deserves a place in this work. This chapter is by A P Le M Sinkinson and is the thirteenth article in the series on World Waterways. 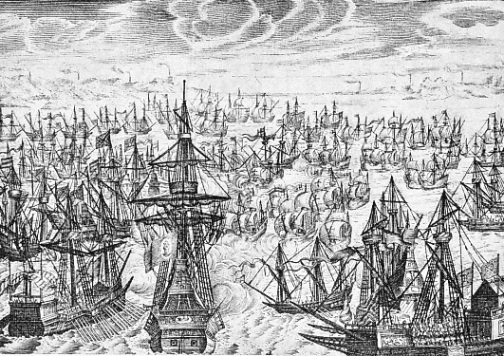 THE ENGAGEMENT OFF PORTLAND on July 23, 1588, is depicted in this illustration from an engraving by A. Ryther. During the two preceding days the English fleet had been pursuing the Spanish Armada up the English Channel from Plymouth. The battle off Portland, Dorset, was however still indecisive. In the foreground of this illustration a large Spanish galleon is firing on an English vessel, and in the background are shown the beacons which gave warning of the Armada’s approach. For long the Dutch were the keenest rivals of Great Britain in maritime interests, particularly when the trade routes to the East were being opened up. Their shrewdness and commercial sense have won the Dutch an important position in world shipping. Industrious, thrifty and businesslike, the Dutch have been a leading maritime nation for many years. They were the natural competitors of Great Britain in carrying trade during the seventeenth century, and it was at the Dutch that the Navigation Acts introduced by Oliver Cromwell were aimed. Undiscouraged by repeated set-backs, the Dutch have brought hard-headed business ability to their shipping industry, and to-day they deserve to rank among the foremost maritime nations. This chapter is by Frank Bowen and is the ninth article in the series on Sea Transport of the Nations. UNDER THE DUTCH FLAG these vessels were known as the Brabantia (left) and the Limburgia (right). The Brabantia was built at Bremen in 1920 as the William O’Swald, and after some years service was sold to the Hamburg-Amerika Line and renamed Resolute. Similarly the Limburgia was built at Westermunde, Germany, in 1914, as the Johann Heinrich Burchard. She has a gross tonnage of 19,821, a length of 590 ft 5 in and a beam of 80 ft 6 in. She was later renamed Reliance. The former Brabantia is of 19,703 tons gross, with a length identical to the Limburgia’s and a beam of 72 ft 2 in. She was sold to Italy in 1936 and again renamed, this time receiving the name Lombardia. IN LAMBTON HARBOUR, PORT NICHOLSON, the wharves, known as the City Wharves, have a total berthage of 20,999 feet. At their berths are usually one or two of the Union Steamship Company’s well-known vessels. 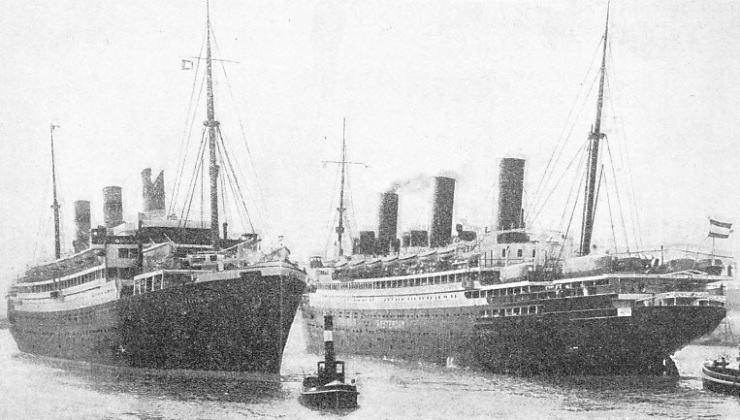 In the photograph above, the nearer Union liner is the Marama, a twin-screw vessel of 6,497 tons gross. The Marama, built at Greenock in 1907, has a length of 420 ft 3 in, a beam of 53 ft 2 in and a depth of 31 ft 2 in. In recent years the introduction of the cargo liner has dealt a heavy blow at tramp shipping, which was regarded as the backbone of the British Merchant Service. Technical improvements, however, promise partly to restore the tramp’s lost position in a rapidly changing shipping world. To the uninitiated the words “tramp steamer” usually imply a rather decrepit little ship, somewhat in need of a fresh coat of paint, in which the crew is over-worked and has to endure perpetual petty discomforts. Nowadays, however, things are changing, and the tramp is not to be despised. In introducing improvements, British owners have had to face the bugbear of costs. It is a fact that many foreign tramps can be operated very cheaply indeed by owners who are not too particular about the treatment of the crew, and who are content with old, decrepit vessels. This chapter, by Frank Bowen, discusses the question of costs, the machinery of the tramp steamer and other modern tendencies in tramp shipping. BEGUN IN AD 67 BY THE ROMAN EMPEROR NERO but not completed until 1893, the Corinth Canal considerably shortened communications in the Mediterranean and converted the Gulf of Corinth into a thoroughfare. The length of the canal is 6,939 yards, or just under four miles. Its relatively narrow width (25 yards) makes it impracticable for vessels to pass one another. The ship illustrated is HMS Duncan, leading the First Destroyer Flotilla through the canal. The Duncan, launched in 1932, has a displacement of 1,400 tons, a length between perpendiculars of 317 ft 9 in, a beam of 33 feet, and a draught of 8 ft 8 in. She has just passed under the bridge that carries the railway between Athens and the Peloponnesos. The plate had previously appeared as the cover to Part 7. STRAIGHT THROUGH THE ISTHMUS OF CORINTH, the canal cutting extends for nearly four miles, with no locks and no curves. The Corinth Canal is therefore more striking than many larger canals because it is possible to see from the Gulf of Aegina to the Gulf of Corinth through the cutting made by man, The canal is used by many Mediterranean passenger vessels, warships and smaller craft for it shortens the distance from the Adriatic to the Piraeus, the port of Athens, by 185 nautical miles. Of all the heroic adventures that occurred with mystery ships during the war of 1914-18, none were more exciting than the exploits of the North Sea fishing smacks which decoyed and sank enemy submarines. This chapter is by Lieut-Com E Keble Chatterton and contains many dramatic stories, including the tale of the Telesia. This the fourth article in the series on Mystery Ship Adventures. The article is concluded in part 38.
a length of 551 feet, a beam of 70 ft 5 in and a depth of 41 ft 7 in. She is a fine modern motor liner, with a special arrangement of superstructure. OUTWARD BOUND FROM CAPETOWN. The Baron Haig was built for H Hogarth & Sons, who have a large fleet of similar ships. A vessel of 3,391 tons gross, the Baron Haig is registered at Ardrossan, Ayrshire. She has a length of 342 ft 3 in between perpendiculars, a beam of 48 ft 7 in and a depth of 22 ft 8 in. 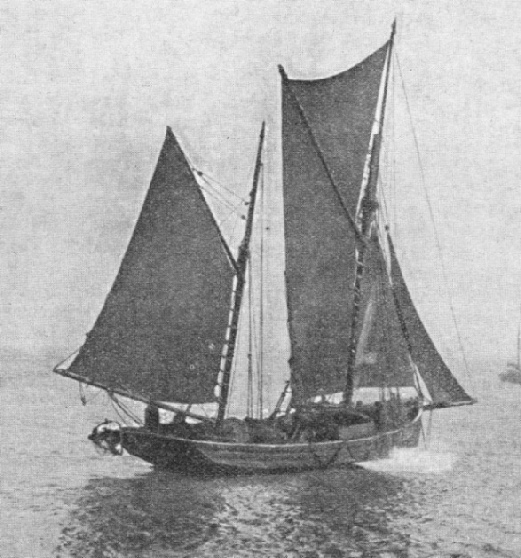 THE LOWESTOFT FISHING SMACK TELESIA was one of the plucky little craft that went to their fishing grounds during the war of 1914-18 not only to trawl for fish but also to catch enemy submarines. Instead of towing a genuine trawl, the Telesia, renamed Hobbyhawk, towed 600 yards of special nets attached to mines that would explode as soon as the nets were fouled. This device caught many submarines for the sailing vessel appeared to be harmlessly towing her nets.